All Hot Spot® spas come ready to use this in-line cartridge system that automatically dispenses SmartChlor® chlorine and minerals for carefree water care. It self-regulates based on the water’s sanitization needs, maintaining a consistent level of protection. 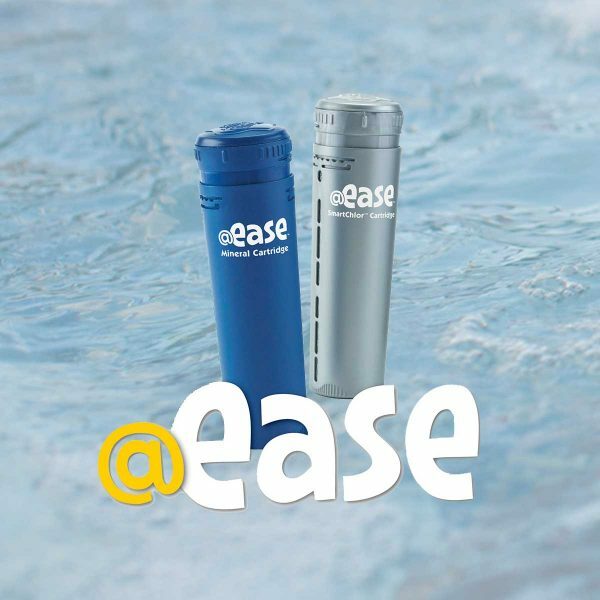 @ease creates softer feeling water that’s virtually free of chemical odors since the system works with up to 75% less chlorine. Simply set the dial on the prefilled cartridges and insert them into the convenient holder, where they fit out of site in the spas plumbing system. The @ease SmartChlor cartridge slowly releases chlorine to sanitize, and the mineral cartridge releases minerals that help balance the pH, condition the water and keep it feeling soft. SmartChlor cartridges last up to four weeks; mineral cartridges last up to four months; shocking is reduced to once a month. While standard chlorine dissolves quickly with spa use, SmartChlor is self-regulating. The system maintains a consistently low free chlorine level between 0.5 to 1.0 ppm at all times, thus avoiding the “yo-yo” effect that comes with standard Dichlor systems. And it can use up to 75% less chlorine. Simply set the dial on the cartridges and insert them into the spa. The release of chlorine and minerals is automatic so there is no guesswork. Use with optional FreshWater® III CD-Ozone system for the ultimate in water care on Hot Spot Spas.